The women of Just Eve pose together. Photo courtesy Just Eve on Facebook. Just Eve, Wittenberg’s premier all-female a capella group, held their spring concert on April 6 at 2 p.m. and 7 p.m. and April 7 at 2 p.m. The performance was a little over an hour long, including a short intermission. Just Eve sang their classics, “Uncle John’s Band” and “And So It Goes,” traditionally performed towards the end of every concert and with the invitation for any Just Eve alumni in the audience to come on stage and sing along. They also introduced some new arrangements, including “Trampoline” by SHAED, featuring Kamilla Jensen, ’19, as the soloist, with a short but excellently executed whistle solo by Sarah Kent, ’20. There was also an arrangement of “Landslide” by Fleetwood Mac, that featured solo performances by Jensen, Claudia Scully, ’19, and Alli Learman, ’19. Their encore was an arrangement of Panic! At the Disco’s “Say Amen (Saturday Night),” featuring Scully as the soloist. After the first couple songs of the concert, the women introduced themselves, stating their majors, hometowns and class years. 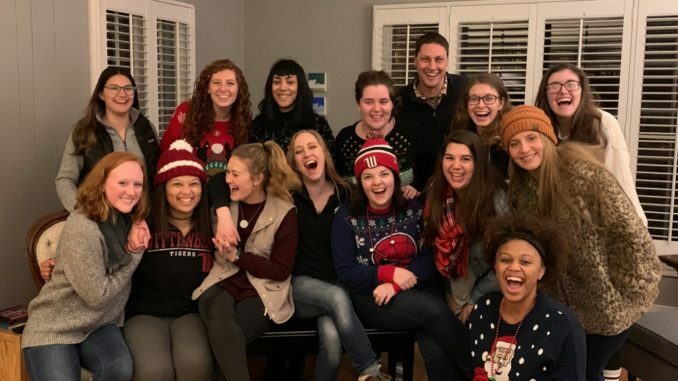 The members of Just Eve come from a variety of majors, from graphic design major Anna Lebold, ’21, who sang soprano in the group, to communication major and Just Eve’s beatboxer, Maggie Keverline, ’20. The diversity of the women translated into an artistic and coordinated sound in each of their songs.